Established in 2008, Shred Station has been committed to protecting the reputations and identities of companies and individuals across the UK for over a decade. We have done this by developing a bespoke confidential data destruction service, and are trusted by thousands of businesses across the UK as a result. The Shred Station story began with a single mobile shredding truck, which provided local businesses with an onsite shredding service. From the start, our mission has always been to offer a high-quality secure shredding service to protect our customers’ confidential information, whilst safeguarding the environment at the same time. Over the years our mission hasn’t changed – but our company has. We now have multiple depots and a whole fleet of trucks. Our clients include many domestic individuals, UK companies of all types and sizes, as well as many public sectors and government organisations. 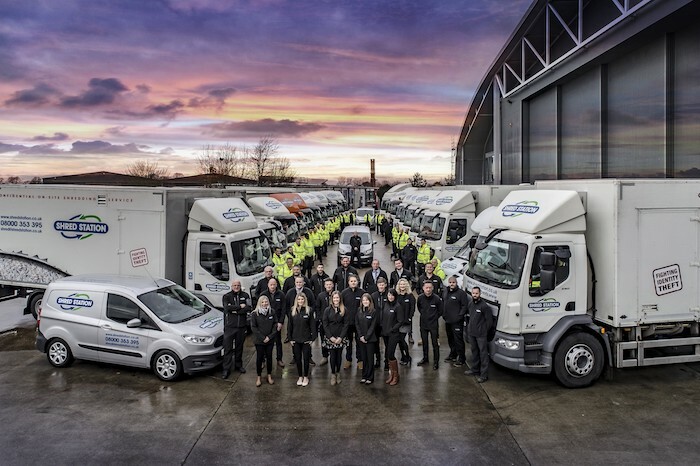 Shred Station is now the UK’s largest independent provider of secure confidential waste destruction and disposal services, as well as high-quality cost-effective specialist waste management services. We maintain a wide range of appropriate and necessary licenses, exemptions, accreditations, and certifications. awarded to us as an acknowledgement of our compliance within legal, environmental, and best practice guidance, as well as ensuring we handle our clients’ sensitive information in line with General Data Protection Regulations. At the heart of our shredding service is a total commitment to security. Every single one of our employees must go through rigorous vetting and security checks in line with BS7858 standards as well as a DBS check, as a minimum. All staff involved with high-security shredding undergo additional security checks, meeting national standards for high-security shredding. Our drivers will arrive at your premises fully uniformed, and receive regular training to keep safe while on the road. Across our fleet, we have a range of shredding vehicles, all of which are designed especially for us. All of our state-of-the-art trucks have sealed bodies, a comprehensive four-camera CCTV system, telematics, and are continually tracked via GPS. Our vehicles are also fitted with many detection systems to keep us safe on the roads too, including panel sensors to detect cyclist and pedestrian movements, audible warning signals for other road users, and low-rise windows to optimise direct vision for our drivers. Our purpose-built shredding depots are equipped with 360 CCTV active 24 hours a day, every day. Our facilities are also equipped with secure perimeters and strict access controls. As a company, we take our Corporate Social Responsibility (CSR) commitments very seriously and are proud to report that we are a CarbonNeutral® certified company with net-zero greenhouse gas emissions. We are continuously looking to implement new features that help to combat climate change and reduce our carbon emissions even further. Our certification under ISO 14001 reflects our commitment to running our operation in the most eco-friendly way possible, in turn helping our clients reduce their own carbon footprint too. We also have a carbon-offsetting scheme which allows clients to opt-in to having a tree planted for every tonne of paper we shred on their behalf. Our Norwich depot is powered completely by solar panels, which can generate 150% of the power required by the facilities, with any surplus electricity being fed back into the National Grid. These are just a few of the many steps we have taken in our journey towards being a carbon neutral company.